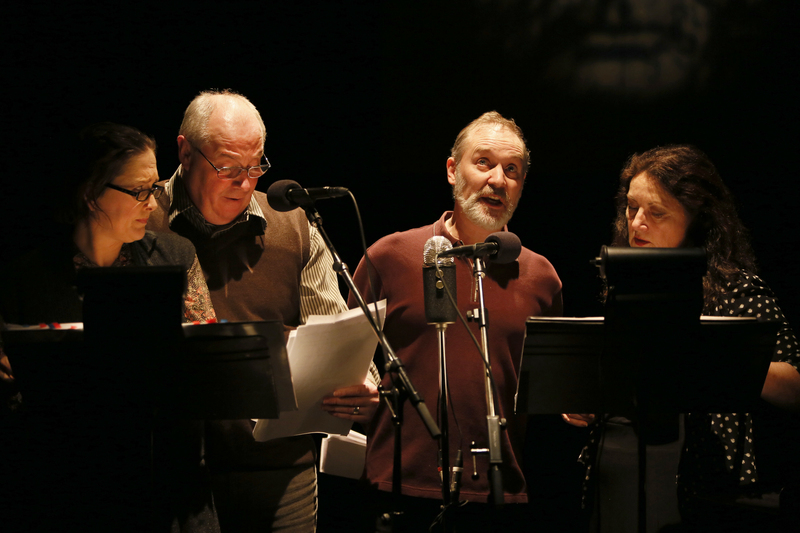 Blackbird Theatre presents the Canadian premiere of Beckett’s classic radio play. Written in 1956, All That Fall by Irish playwright Samuel Beckett has never been professionally produced in Canada, until now. First broadcast on BBC radio, Beckett never allowed the play to be produced on stage. He insisted that it was meant to be heard, as it was better if the audience could imagine the story for themselves. The Beckett estate recently allowed for the play to be produced on stage, but only as a radio play. Comparing a radio play to a stage play is like comparing a book to a film — one must imagine what everything looks like, and picture the story unfolding in one’s mind. A radio play produced on stage is a bit strange because we are watching actors on stage, but they aren’t really acting anything out so much as reading their lines as if they were the voices for an animated film. I found watching the actors on stage distracted my mind from the task of picturing what was happening, and it was almost better to close my eyes and just listen. The play’s title comes from Psalm 145:14 of the King James Bible: “The Lord upholdeth all that fall, and raiseth up all those that be bowed down.” When the main character, Maddy Rooney, says this line, she and her husband roar with incredulous laughter. An abstract portrait of Beckett presided over the stage as the actors brought this story to life through dialogue and sound effects. As with Beckett’s Waiting for Godot, this is a play with little plot or action. Maddy Rooney grumbles along to meet her blind husband, Dan, at the train station. She meets a few interesting characters along the way, including Mr. Slocum, who gives her a lift, and Miss Fit, a religious woman who describes herself as “not all there.” Dan’s train is delayed for an unknown reason, and as the Rooneys take the long walk home from the station, Dan refuses to tell Maddy what the holdup was. Despite very little happening in this play, the grim comic demeanour of Mrs. Rooney holds your attention for over an hour until the surprising conclusion. Mr. Rooney remarks repeatedly, “If I’m alive tomorrow,” and there are many matter-of-fact references to death and aging that foreshadow the gruesome ending. Ultimately, the play’s dark humour and Mrs. Rooney’s bleak outlook is what makes this classic both entertaining and profound. Blackbird Theatre presents All That Fall at The Cultch from December 29, 2014 to January 24, 2015. For more information, visit thecultch.com.